At ICIS our analysts blend deep market expertise with behavior-driven analysis of the California, Quebec and RGGI schemes. That means we can help you identify the policy and regulatory risks early and understand their potential impact on the market. The CA/QC cap-and-trade Portal provides a complete suite of market intelligence from qualitative analysis to help you identify regulatory risks early through to the inputs and outputs from the Timing Impact Model. The Portal is ideal for traders and analysts, and offers everything you need to plan your trading strategy and take advantage of profitable trading opportunities. The ICIS RGGI Portal is a blend of qualitative analysis and a suite of inputs and outputs from ICIS’ Timing Impact Model (TIM) which include price forecasts, fundamental data and company specific behavior data. The RGGI Insight product is a blend of news and expert analysis on what’s driving participant behavior behavior in the Regional Greenhouse Gas Initiative (RGGI). Our analysis is focused around the quarterly auctions and is informed by ICIS’ behavior driven Timing Impact Model. The CA/QC cap-and-trade Insight provides the highlights of ICIS’ California/Quebec market analysis. It’s ideal for people who want an overview of the impact of regulatory changes, market risks and breaking news but don’t need detailed datasets. CA/QC cap-and-trade News brings you market-relevant breaking news with a focus on stories researched by our own journalists. It’s aimed at stakeholders who need to stay up to date with how the California and Quebec markets are evolving but don’t need detailed analysis or datasets. 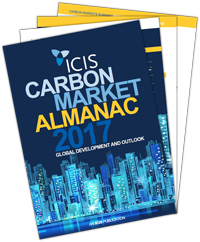 The ICIS Carbon Markets Almanac provides a top-level view of global efforts to combat climate change with cap-and-trade systems. For each of the different schemes worldwide, it highlights key design characteristics and includes spotlight articles discussing specific system features. Our overarching breakout articles for 2017 include an analysis of the post-2020 carbon world and how we will get there, a discussion of President Trump’s impact on carbon trading, as well as a study on the Brexit and its effect on EU carbon and power markets. Easy access to all resources including PDFs, Webinars, podcasts, videos and much more.